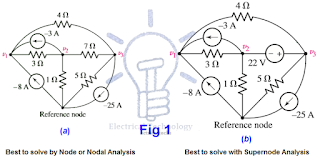 Today, we will try to answer the common question that why we use Supernode circuit analysis while we can simplify the circuit by simple Node or Nodal Circuit analysis. In previous article, we have discussed that why we use supermesh circuit analysis instead of using simple mesh analysis for circuit simplification. If you got this point, then this is the same case about the discussion. If not satisfied, let me try to explain in the following example. Consider both circuits in the following fig 1. did you notice something different? The difference in both circuits is that there is an additional voltage source of 22V instead of 7Ω resistor between node 2 and node 3. And this is the main point. In Node or Nodal analysis, we apply the KCL (Kirchhoff’s Current Law) at each non-reference nodes i.e. we apply the simple KCL at once on three nodes in fig 1(a). If we do the same i.e. 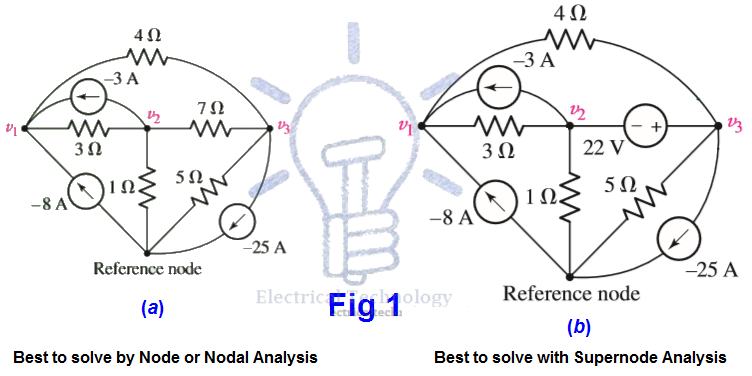 apply the Nodal analysis instead on Supernode circuit analysis on the circuit in fig 1 (b), we face some difficulty at Node1 and Node2, because we don’t know that what is the current in the branch with the voltage source? In addition, there is no such a way by which we adjust the situation i.e. we can’t express the current as a function of the voltage, where the definition of the voltage source is that the voltage is independent of the current. Due to these difficulties and troubles, we use supernode circuit analysis instead of Nodal analysis in the above fig 1 (b). There are two methods to simplify the circuit in the above fig 1 (b). The 1st one, which is more complex, is that to assign an unknown current value to the branch contains the voltage source. Then apply KCL three times on the 3 Nodes (one KCL equation for each node). At last, apply KVL (Kirchhoff’s Voltage Law) which is v3–v2 = 22V between Node2 and Node3. In this case, we get four (4) equations for unknown values in the above example, which is little bit complex to simplify. The 2nd method is easier than the above method which is called Supernode analysis. In this method, we treat Node2, Node3 and the voltage source of 22V together as a sort of Supernode and apply KCL to both nodes (Nod2 and Node3) at once. The supernode is indicated by the region enclosed by the dotted line. This is possible because, if the total current leaving Node2 is zero (0) and the total current leaving Node3 is zero (0), the the total current leaving the combination is zero. This concept is shown in the following fig 2 (b) with the supernode (the area enclosed by the broken line). Now, we will solve the circuit below by step by step supernode circuit analysis and then, we will summarize the whole supernode analysis (step by step). Use Supernode analysis to find voltage across each current source i.e. v1 & v2 in the following fig 3 (a)? We begin by writing a KCL equation for Node1. 4 = 0 + 3v1 + 3v3 …. → Eq 1. 9 = 2v2 + 6v3 + 3v3 – 3v1 + 0. 9 = – 3v1 + 2v2 + 9v3 …. → Eq 2.
v2 – v3 = 5 …. → Eq 3.
v3 = 0.575 V or 375mV. Redraw the circuit if possible. Count the Number of Nodes in the circuit. Design a Reference Node. This may be the node with the greatest number of branches. So that, we may minimize the number of of equations. Label the Nodal Voltages. Which are (N-1), where N= number of Nodes. Form a Supernode if the circuit or network contains voltage sources. This job is done by enclosing the source terminal, and other circuit element connected between the two terminals with the dotted line enclosure. This is shown in the above fig 2 (b). Write a KCL (Kirchhoff’s Current law) equation for each non-reference node as well as for each supernode which does not contain the reference node. On the first side, add the currents flowing into a supernode or node from the current sources. On the other hand, add the currents leaving the supernode or node through resistors. Take the “-“ sign in the account while writing KCL equations and solving the circuit. One KCL (Kirchhoff’s Current Law) is needed for each defined Supernode which can be accomplished by simple application of KCL. In simple words, relate the voltage across each voltage source to nodal voltages. If dependent sources appear in the circuit, In this case, express any additional unknown values and quantities like currents or voltages other than the Nodal voltages in terms of suitable nodal voltages. Arrange and organize the system of equations. At last, solve the system of equations for the Nodal voltages such as V1, V2, and V3 etc. there will be (N-1, where “N” = Number of Nodes) of them. If you find difficulties to solve the system of equations, refer to the above solved example.